The controversy which ensued focused on the usual birther nonsense, overlooking Huckabee’s implied (and ahistorical) view that the British were in fact not “a bunch of imperialists.” His confident, and presumptive, use of the word “ours” suggests that there is still work to do in setting straight the historical record on British East Africa. Behind Huckabee’s comment was the rumour of President Obama’s return of a bust of Churchill given to George W. Bush by the British Government. (According to this fabrication, it was replaced by a portrait of Lincoln.) Rather like the urban legend of Bush’s tearing up and burning of the carpet on which Bill Clinton and his staff had stood — and assumed other notorious positions as well —, Obama’s mythological gesture was soon whipped into a peak of ideological symbolism. Meanwhile, the victims of the Kenyan violence await a proper accounting. For almost half of the twentieth century, British East Africa — what we would now call Kenya — was a peculiar amalgam of two colonial systems: the American slave plantation and the Canadian Indian Act. The British took most of the land for themselves and forced the indigenous people to farm it, instituting for the Kenyans reserves, residential schools, and a pass system. Churchill is on record as having winced at the, as he saw it, unnecessary brutality of the British occupation. Nonetheless, as the years wore on and he assumed office, the brutality increased with his active support. 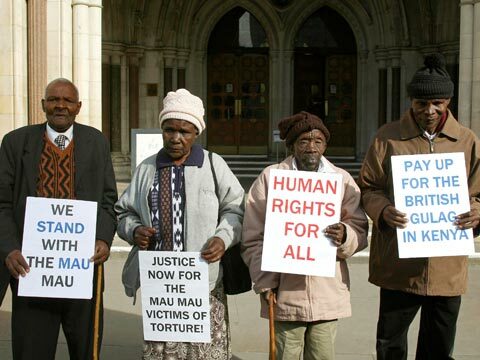 The Mau Mau uprising was an effort of a Gikuyu tribal faction, through the agency of the Kenya Land and Freedom Army, to liberate Kenya from an imperialist system which imposed widespread poverty, torture, hunger, disease, and overcrowding. Roughly between 1952 and 1960, the so-called Kenyan Emergency claimed the lives of thousands of British and Kenyans, but mostly by far Kenyans, the revolution quickly having become a purge, from both sides, of actual and suspected Mau Mau and British sympathizers and collaborators. In his 1975 short story, “The Village Priest,” exiled Kenyan writer Ngugi wa Thiong’o portrays with deft irony the common figure of the colonized individual who comes to identify with his colonizer. Throughout Africa this outcome was a deliberate objective of colonial policy, the most venomous example perhaps being the Belgian in Rwanda. Here, the Tutsi were set up as a local ruling sub-class, beneath the Belgians but above the Hutu. The genocide may be traced back to the tribal animosities cultivated within this divide-and-conquer strategy. Reading Ngugi wa Thiong’o, one acquires a nuanced and human portrayal of the business of colonialism, as well as the repudiation of it. The diary records a local term for the sixty-year British rule in Kenya: mbwa kali, a phrase meaning “ferocious dog,” sometimes displayed even today on posted signs as a warning at the entrances of properties. General George Erskine, who oversaw British military operations throughout the uprising, took a dim view also of the settlers, concluding that the country was “a sunny land for shady people.” In the end, the brutality of the British discredited their occupation of Africa just as their treatment of the Indian National Congress had on the subcontinent. In both territories, Churchill had allied himself with the losing cause of British imperialism. Huckabee’s denial of the British role in the violence is far from an isolated case. One expects the conservative anglo-american to cast a colder eye upon the charge of imperialism, unless the nation at issue is the Soviet Union. But the British were undeniably imperialists in Africa, as they were elsewhere, and the Kenyans suffered horribly for it. It is a shame to suggest otherwise. This entry was posted in History, Wayne's Picks and tagged British East Africa, General George Erskine, Kenya, Mau Mau Revolution, Ngugi wa Thiong'o, Steve Malzberg Show, Winston Churchill. Bookmark the permalink.